Our Retired and Senior Volunteer Programmes (RSVP) offer volunteering in local schools across the UK, for people aged 50+. Older volunteers supporting young school pupils with their learning on a one to one basis can help to improve students’ confidence, social skills and capability in school. Volunteers are supported in their placements at local schools by both local Volunteer Organisers and Volunteering Matters staff. 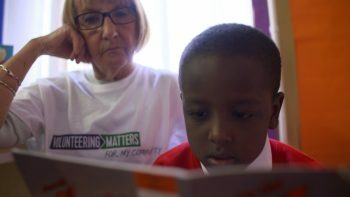 Depending on the needs of the school and pupils, volunteers are matched with students who may be struggling with their reading, their math skills or other primary learning. Volunteers will work either one-to-one or with small groups to help improve the confidence of young people with their learning and support them to develop. Although the majority of our school volunteering opportunities are based in primary schools, a small percentage support secondary schools. With school class sizes increasing due to a growing population, especially in large cities, pupils may find themselves receiving less one to one direction and support from their teachers. The RSVP school volunteers support the teachers and their pupils, providing direct educational support to those pupils who need it most. Our Employee Volunteering programme also offers this type of volunteering to organisations. Please see their page for more information.